Lewis Systems & Service Co., Inc. is proud to represent the full line of Hitachi air compressors, serving the Greensboro, Charlotte, Raleigh/Rocky Mount NC and Lynchburg VA areas. The Hitachi line of air compressors includes Hitachi Oil Free Rotary Screw air compressors, Oil Free Scroll air compressors and Vortex blowers. With Hitachi, you will know you are getting the most innovative, technologically superior products available in the industry. 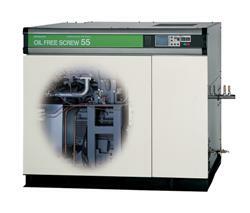 Hitachi Oil Free rotary screw compressor packages range from 20 to 300 hp. Both fixed speed and variable speed units are available. Single stage, two stage, air cooled and water cooled options provide a complete line of solutions for your needs. Purity of Air Compression: PTFE-Free coatings ensure air purity. (Patent Japan P3740178). Stainless steel rotors eliminate possibility of corrosion and promote adhesion of coatings. Hi-Precooler: Air cooled units use a stainless Hi-Precooler to protect the aluminum after/inter cooler, maximizing the thermal efficiency of the cooling system. Energy Efficiency: Hitachi’s original rotor profile designed to optimize clearances for increased performance and efficiency. A matched VFD & high efficiency motor provide stable pressure control and low power consumption. Environmentally Friendly: Oil mist remover (Patent USP 05011388) eliminates environmental emissions, promotes purity of air compression and recaptures oil mists. A quiet enclosure is standard, designed for the minimization of leak paths. Versatility of Design: VSD can adapt to variation in demand quickly. Lead/Lag (2 units) is standard. Instantaneous Power Interruption (IPI) restart is standard. Unit is smaller in overall dimension and panel accessibility promotes space conservation. Hitachi Oil Free Scroll air compressor packages range from 2 to 7.5 hp. The SRL series compressors provide reliable, environmentally friendly compressed air at the lowest energy cost. With Hitachi’s proven experience and innovative technologies, Oil-Free and Contaminant-Free air is now available for even the most discriminating compressed air applications. Innovation through Technology: Proprietary tip seal and unique scroll wrap provide increased performance, extended service intervals and high efficiency. Special alumite treatment extends scroll life and limits life cycle cost and a mulit-stage cooling system stabilizes discharge temperature. Energy Efficiency: Microprocessor based controls provide the optimized package operation under varying conditions. Cycle control logic protects from rapid cycling. Environmentally Friendly: 100% Oil-less design eliminates harmful emissions into the environment and conserves natural resources. Industry Leading Sound Levels & Vibration: Standard quiet enclosure provides range of 40-50 dBA. Low sound levels allow placement in a variety of locations. Low vibration design minimizes leak paths. Versatility of Design: Hitachi Oil Free Scroll Compressors are constructed to enable easy access for inspection and maintenance. Incorporation of leading design technologies allows the unit to consume less space. Hitachi E Series High Volume Vortex Blowers: Hitachi’s Cup Shape Impeller generates air by non-interference, single path air compression. This enables the E-Series Vortex Blower greater efficiency for large air volume applications. The Hitachi Radial Vane Impeller Design enables operation in either direction with the same efficiency allowing it to be used in a variety of applications. Hitachi G Series High Pressure Vortex Blowers: Hitachi’s Patented Three Dimension Impeller generates high-speed air by maintaining an optimal vane surface. This enables the G Series Vortex Blower to provide higher pressure for discharge and vacuum applications. The innovative cooling system for the G Series enables fully closed suction operation for a variety of vacuum applications. With a growing concern for the environment in which we live, along with the products we consume, not only Oil Free, but Contaminant Free air is quite important. To address these concerns a new, more rigorous, class was added to the existing purity classes: ISO 8573-1:2001 Class 0. Hitachi Oil Free Air: With over 50 years of experience in Oil Free Compressor technology, Hitachi has become one of the worlds leading providers of Oil Free Dry Screw products. Risk Free Air: With a focus on societal responsibility, Hitachi achieved certification of the ISO 8573.1: 2001 Class 0 for the Hitachi DSP Series Oil Free Rotary Screw Compressors. This certification has been validated by third party laboratory testing. This certification enables Hitachi to provide a variety of Innovative and Technologically Superior products to our customers.